A big bottle of maple syrup was sitting on my counter just tempting me to use it again and I could not resist. 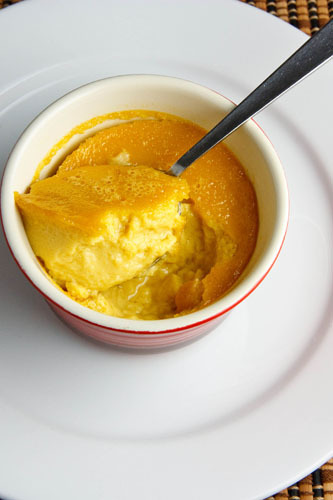 I opened my browser and did a quick search for bookmarked maple recipes and came across this one for maple pots de creme on Eggs on Sunday that sounded decadently delicious. Pots de creme are cream mixed with some kind of flavour, such as chocolate or maple syrup along with a sweetener if required, that is baked with egg yolks until it sets like a custard. Maple flavoured pots de creme sounded irresistibly good and I got to making them right away! The maple pots de creme were pretty easy to make and well worth the hour waiting for them to bake while being tortured by their amazing aroma. They were nice and warm and light and creamy and full of maple goodness! With a nice show of will power I wrapped the extras up in plastic wrap and placed them in the fridge. The leftovers were really nice while still cool from the fridge. They were a bit thicker and nice and cool and refreshing but they were still amazingly creamy and full of maple flavour. Bring the cream, maple syrup and salt to a simmer in a sauce pan. Mix the egg yolks and vanilla in a large bowl. Mix the cream mixture into the egg yolks a little at a time. Pour the mixture into 4 ramekins. Place the ramekins in a baking dish and fill the baking dish with hot water until it come halfway up the ramekins. Bake in a preheated 300F/150C oven until set, about 50-60 minutes. Remove from hot water bath and let cool to room temperature. Hmm, I can imagine how smooth, silky and melt in your mouth type of dessert. Never made it with maple syrup before, but it does sound very sweet. I love the idea of a smooth and creamy texture against the sweetness of maple syrup. Kevin – These are so wonderful looking, and would be a perfect treat to take to a friend who’s ill and can only eat soft foods. Kevin, this sounds great. If you do them again try adding 1/2 teaspoon pure maple extract to the base. It will boost the maple taste. This is right in my alley Kevin. I love maple syrup and these are really nice. They look like they melt in the mouth. So glad I refound your blog. I was following you before I started my own blog and then lost bookmark, couldn’t remember name. Found you when you commented on another blog. I remember Kevin. Now you are finally bookmarked. Actually, I’m going to subscribe. BTW, what a a delicious looking dessert. Hum, that sounds and look delicious. That does look fantastic! I’m on a maple kick myself these days. . .would love to try these out! YUM, c’est le temps des sucres! I’d love a serving of this type of custard! I’ve not tried it with maple, and I think that I should remedy that! Oh just divine. Once again, Kevin, simply brilliant. Could you torch the top with a bit of sugar, like creme brulee? Or is that not appropriate for a pots de creme? I have never tasted this kind of dessert before, looks so yummy. It looks like my favorite dessert Crème brûlée’, how would you use maple doing Crème Brûlée? Maybe I’ll just wait to see if you post a crème brûlée of maple. 😉 hint..hint.. This looks so smooth, silky and luscious! I have a big bottle of maple syrup on my counter too. This looks like a great way to use some! yummarama! I love maple syrup and combining it in pots de creme is inspirational! MMMMMM….Kevin!! When will you wrte a cookbook?? I will buy it because your recipes are fenomenal!!! Wow how can you tempt us with all these delicious dessert. It is welcome anytime of the day. Kevin, these are out of the world! YUM! I love the color! And I’m a big fan of any kind of dessert that is served in an individual serving dish – no sharing! Delish Kevin everything on your blog always looks great I can’t wait to try this one. How clever! Maple is not a flavor I think about cooking with too often in sweet applications … go figure! That looks wonderful! So smooth and creamy. Great dessert! You are making me swoon! Hi Kevin, I’m glad you enjoyed the recipe! These are one of my favorite desserts…and now that maple sugaring season is starting, I may have to make these again! Maple is awesome. These sound great! Another Winner Kevin, sounds amazing and looks even better! Your description of them makes me want one right now!!! Looks very good but i miss the mexican food. Wow, this looks SOO good! Thanks Kevin! I think I found my new favorite site!!!! What a wonderful way to put some maple flavor into your day. Yumm! I bet those did smell amazing while baking! Lovin the whole maple thing you’ve been doing, saved the cheesecake recipe of yours.. I love that you love maple syrup and use it in a bunch of your creations. I can never get enough of the stuff. Never thought of it this way, so I bet it was so smooth and so tasty. This would be fabulous. I need to give it a try. I’ve been seeing maple recipes all over the web this week. What a fun change of pace this is! Love it. This would a perfect dessert to make for a special dinner guest. I might just make this for my dad, as he is coming to visit soon. I just added this to stumbleupon, hopefully you’ll get some props for the unique recipe. Good luck, looks great! These sound incredible! Thanks for sharing! ooooh that looks delicious, Kevin! I love the idea of maple pots de creme! This recipe spoke to me. I am a confirmed Maple junkie and knew I had to do this. All I can say is OMG! The smooth creamy texture from the moment you dip your spoon reinforces the fact that this is going to be a bite to behold. It is like a Creme Brulee but better! Is this anything like Flan? Pal Ashford: Yes this is very similar to flan!